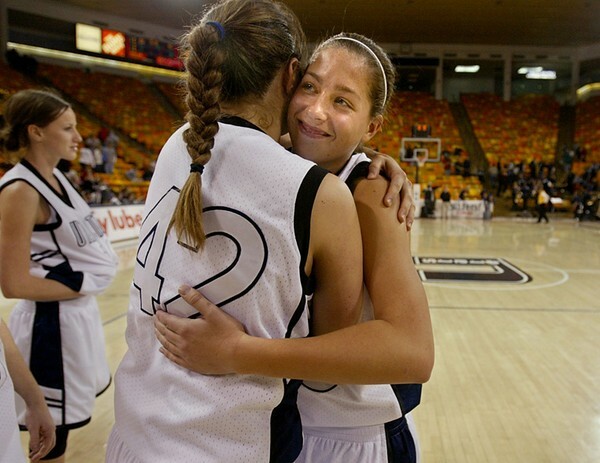 11/21/03 ---UTAH STATE WOMEN'S BASKETBALL --- LOGAN, UT: Freshman guard Christina Zdenek (#42) gets a hug from teammate Sammi Stuart at the end of their first game, a 79-60 loss to Southern Utah University. Utah State reinstated its women's basketball program on March 5, 2002 after a 17-year absence and play their first game Nov. 21 against Southern Utah University. Photo by Robert Hanashiro, USA TODAY.